The wood-framed Mission House, built in 1821, was one of the first wood-framed buildings built in Hawai‘i. 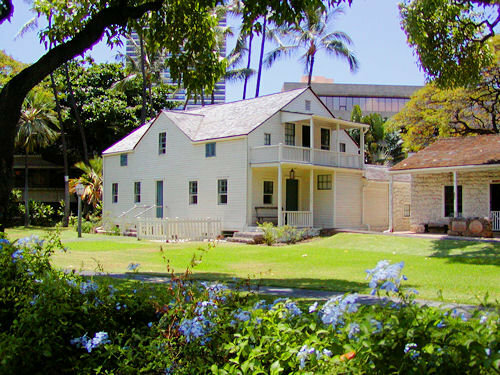 The frame house stands on the grounds of the Hawaiian Mission Houses Historic Site and Archives, near Kawaiahaʻo Church on the makai side of King Street. Architecturally, it has a simple and straight-forward design; the relatively low ceilings, and basement are strong evidence of its New England concept, foreign to the temperate climate of Honolulu. It has two stories plus a basement and measures about 40-feet in length and 24-feet in width, excluding the kitchen wing (which extends the basic rectangular plan on the right rear (Ewa-makai) by about 20-feet.) The overall height is just over 23½ feet. The first floor (which has been altered by both additions and demolition) consists of two rooms across the front. A smaller room and hall are located behind the front room on the left. The second floor consists essentially of two large rooms separated by a stair-hall. The basement walls are adobe brick set in a mud mortar. The basement consists of one room on the left (Waikīkī) and a larger space on the right. Basement access is by an exterior coral stair on both the front and rear and an interior concrete stair leading down from the kitchen. All walls are plastered, the floors are brick and the ceiling exposed wood. The Frame House was used as a communal home by many missionary families who shared it with island visitors and boarders. It served as a residence for various missionaries, including Hiram Bingham, Gerrit Parmele Judd and Elisha Loomis. In 1925, the premises were again inspected and again extensive insect damage was found. By 1935, the house was completely renovated and restored. Since 1935, various minor repairs such as repainting and some plastering have been undertaken. The image shows the exterior of Hale Lāʻau (the Frame House) at the Hawaiian Mission Houses Historic Site and Archives. In addition, I have included other images and plans of the building in a folder of like name in the Photos section on my Facebook page.